Visa Philippines will relieve your crucial need for entry into the Philippines. It can fashion your visit Philippines into a rewarding, unhindered experience. Consistent with Philippine immigration law, you can enter the country as a non-immigrant or as an immigrant. Your Philippines visa empowers you the moment you set foot on Ninoy Aquino International Airport, also called Manila airport. Beginning with your choices of cheap flights to Philippines, you will eventually make the trip to measure the Philippines as a top destination choice to see, live or invest in. Your best, error-free source of information regarding requirements for a visa Philippines is the Department of Foreign Affairs (DFA). Visit its website at http://www.dfa.gov.ph, click ‘consular services’, click ‘visa information’ and click ‘visa guidelines’. The ‘visa guidelines’ link will return a 1,500-word requirements list. As a general rule, any nationality (except those classified as restricted nationals) is admitted into the Philippines without visa for an initial authorized stay of 21 days and extendible for another 38 days. Those with entry visas - foreigners who obtained temporary visitor visa from a Philippine consulate are admitted for an initial stay of 59 days. Both categories of temporary visitors may be granted extensions ranging from 1 to 2 months at a time, not exceeding 1 year. Temporary visitors who have stayed in the Philippines for at least 6 months must secure an Alien Certificate of Registration (now ACR I-Card is being implemented) and a Certificate of Residence for a Temporary Visitor (CRTV) and fingerprinted. There are currently 154 countries whose nationals are allowed to enter the Philippines without an entry visa. In contrast, there are 48 countries where visa is required of their nationals. To find out where you belong, please see http://immigration.gov.ph, then click ‘frequently asked questions’ and ‘general information’. You can get the immigration fees for all kinds of visa from the same website. Once there, click the ‘immigration fees’ link. You can get this application done at the Philippine Embassy or Consulate nearest your place in your country. There maybe additional paperwork as deemed necessary. If you engage the services of a visa consulting firm, you will not sweat it out, but of course you have to pay for consulting fees. Visa assistance in the Philippines is widely practiced by private visa consulting firms. Such assistance is beyond the functions of government agencies. These firms can even extend parallel booking services for flights to Manila or flights to Philippines. A valid visa back to your country. A letter from the company in the applicant’s country stating the purpose and duration of the trip. A photocopy of the applicant's airline ticket or confirmed travel itinerary… maybe either from Philippine Airlines, Cebu Pacific or Air Philippines. A photocopy of the applicant's airline ticket or confirmed travel itinerary. To corroborate your business efforts, the DFA has institutionalized the issuance of the APEC Business Travel Card (ABTC) to bona fide businessmen. This card facilitates and streamlines your entry to the economies of the Asia-Pacific region. Cardholders are saved the hassle of applying for individual visas or entry permits in 17 Asia-Pacific nations. You can obtain a permanent resident visa in the Philippines as an immigrant should you wish to settle home in-country. Quota/Preferred Immigrant visa – this is governed by an order of preference and granted to aliens with or without nationalities and is issued on a calendar basis and cannot exceed the numerical limitation of 50 in a given ear. The foreigner must come from a country which allows Philippine citizens to become immigrants in that country and this privilege must be embodied in a reciprocity agreement. 13(a) – issued to a foreigner on the basis of a valid marriage to a Philippine citizen; If the foreigner is from a country of which the Philippines does not have an existing reciprocity agreement, only a temporary residence visa (TRV) will be issued to him. 13(b) – issued to a child who was born outside the Philippines during the temporary visit of the mother who has been previously admitted for permanent residence in the Philippines. 13(e) – issued to one who was previously granted permanent residence in the Philippines and is returning to an unrelinquished residence in the Philippines after a temporary visit abroad. 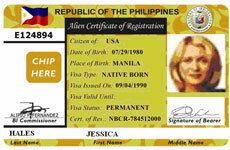 13(g) – issued to a natural born citizen of the Philippines, who has been naturalized in a foreign country and is returning to the Philippines for permanent residence. You can find the requirements checklist for each of the above categories in http://immigration.gov.ph. Once there, click ‘immigration visa’. For the fees, click ‘immigration fees’. Recently, the Bureau of Immigration has introduced a new system of Alien Certificate Of Registration called ACR I-CARD which automates the registration process. A pre-arranged employee visa is a working visa for employees of foreign corporations, with no nationality requirements prescribed. This visa is granted for a term of 1 year, but must not exceed the affectivity of the employment contract. There shall be extensions, the total of which shall not exceed 5 years, except in exceptional cases where strong justification is shown and the expatriate occupies a managerial/executive position. 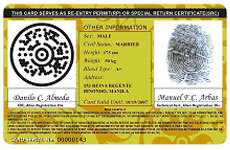 Alien Employment Permit is required prior to the issuance of this visa. Commercial visa - Issued professionals. Missionary visa - Issued to the religious. You need a Philippines Student Visa to study in-country. You must be at least 18 years of age at the time of enrollment and have sufficient means to finance your education. Visa Philippines is your crucial tool for entry into the Philippines. It can fashion your visit Philippines into a rewarding, unhindered experience. With your visa as a non-immigrant or as an immigrant, you can come and gauge the Philippines as a top destination choice to see, live or invest in. Come See, Live or Invest in the Philippines.